Because of the excessive demand for wood raw material in the harvesting process, it is obligatory to obtain the wood without losing sight of quality as well as quantity. Operational activities in forests cause substantial damage to the forest ecosystem. In the timber extraction phase, the first step of timber transportation, the damage originating from harvesting operations can be reduced by using skylines, a mechanized logging technique. A Gantner long-distance skyline was tried in Artvin, which is located in the mountainous eastern Black Sea Region of Turkey. In this study, factors such as total work time and productivity were investigated. Therefore, in both studies (Alabalik and Soçidibi) work and time consumption were observed and analysed, and their productivity estimated. The following results were obtained from the Alabalik and Soçidibi study areas: in the average workplace the time of timber extracted productivity was 4.03 m3 per hour in the Alabalik study areas, where logs of coniferous (fir) were logged as cut-to-length. There was an average 80 percent hill slope and the skyline cable's length was 1 200 m. The corresponding result for the Soçidibi area was 6.98 m3 per hour, where coniferous (spruce) logs were also extracted. In places the terrain slope was 70 percent and the cable's length was 700 m. In both study areas, extraction was done from uphill to downhill. Arrival of the loaded carriage to downhill, pulling of bundle hook to logs, hooking, and unhooking were the most effective work phases. Dragging from side, number of pieces and average volume of logs were found as effective for productivity. Due to using a skyline, the skidding damage to forest soils, stumpage, and regeneration was reduced considerably. A decision should be made during the tactical and operational planning stages concerning where the skyline corridor should be mounted in order to shorten the setting time of long-distance skylines. In practice, multiple chokers should be used; dragging from the side should be done before mounting the skyline. Experienced winch operators and workers must be employed. They must be trained and should use safety clothes, shoes, helmets and gloves. Extraction is the process of moving trees or logs from the cutting site to a landing or roadside where they will be processed into logs, or consolidated into larger loads for transport to a processing facility or other final destination. Regardless of the type of logging system used, extraction is a difficult, often hazardous operation that can inflict substantial damage on the forest ecosystem (Dykstra and Heinrich, 1996). In Turkey, about 27 percent (20.7 million ha) of total area is covered by forests and other wooded land. Of these areas, 48 percent are productive forest land. Total high forests have 1 032 740 659 m3 timber volume (Ministry of Forestry, 2000). Overall demand for timber, terrain use without planning, exceptional legal regulations in the forest law, and grazing are causing the drawing of forests to mountainous terrain, where forestry activities are heavy and quite costly. Because of the superabundance of underemployment in rural regions and forest villages of Turkey, forestry harvesting operations are still carried out by forest villagers. Thus, there are no mechanized harvesting operations in some parts of Turkey. The use of skylines, short-medium-long distance, began at the end of the 1970s in Turkey, mostly in the mountainous eastern Black Sea Region of Turkey (Aykut, Acar and Sentürk, 1997). Our study areas of Alabalik and Soçibidi - in the region of Artvin - have a total of 1 343 074 ha of forest land, and 82 percent of these areas are high forest. In that forest area, the Artvin Region has 6.6 percent of the total Turkish forest area. The average timber volume of these areas is 93 m3 per hectare (Acar and Gümüş, 2000). A study has established that the field slope of these forest areas ranges from 51 to 75 percent (Erdaş and Acar, 1995). In another study, it was determined that 15 to 17 percent quantitatively, and 10 percent qualitatively, losses occurred with manual extraction methods in these areas (Gürtan, 1975). The study was made in the Cogla, Karçkal, and Çukur areas of Artvin. Productivity was found to be 3.57 stere per hour in Cogla, 5.10 m3 per hour in Karçkal, and 4.36 stere per hour in Çukur when using long-distance winch skylines (Acar and Erdaş, 1992). Productivity was 5.01 m3 per hour when using a Gantner long distance skyline in the Artvin Region (Acar, 1995). By using a Gantner long-distance cable crane in another study in Artvin, with an average cable way distance of 1 500 m, productivity was 4.6 stere per hour (Öztürk, 1996). Again in the mountainous Artvin Region another study showed average time consumption was 27.40 minutes per shift, average long distance was 700 m, and productivity was 4.96 m3 per hour when using a Gantner skyline (Acar and Gümüş, 2000). In Italy, 16 percent of the forests are located on slopes ranging from 60 to 80 percent; wood harvesting is done from roads, on short distances, only with skylines. In the case of forests located on slopes of 40 percent, with roads at distances of 400 -750-1 200 m, pole type skylines are used in the first and second cases, and traditional cable car skylines in the last case. Daily man yields amounted to 8–10 m3 in the first cases and to 5–8 m3 in the case of cable car skylines (Baldini and Pollini, 1998). Generally, traditional long-distance gravity cable systems have spans of 1 000 to 1 500 m and logs can be dragged up to 50 m from both sides of the skylines. For instance, in Bhutan and Pakistan, when using a single drum yarder of 50kW and a 25 mm skyline with a cable length of 1 000 m and carrying capacity of 2.5 tonnes, a daily productivity of 20 to 25 m3 has been reported (Heinrich, 1998). In Bhutan, on average the productive work time required per cubic metre of timber extracted by long-distance cable crane was 15.34 min for the traditional practice and 10.52 min for the modified system used. A productivity of 3.88 m3 per hour workplace time was found for traditionally clear-felling practices, and with group selection felling systems it was 5.01 m3 per hour workplace time (Winkler, 1999). In Austria, 14.48 percent of the timber is harvested with cable systems. This ratio is 1.769 million m3 yield. The amount of timber harvested with cable logging systems has doubled over the last ten years (Trzesnowski, 1998). In South America, a modified North Band System is used to ground yard bundled 1.5 m wood for distances up to several hundred metres. The output of such a system depends on yarding figures, for example, 10 m3 per hour, 5.5 m3 per hour and 3.5 m3 per hour, respectively. The average trip payload is 0.85 m3 when a modification of the Tyler yarding system is used in one region of South America; the average output of the system varies with yarding distance and terminal times; for example, output for distances of 100, 500, and 1 000 m is around 9.5, 6.1, and 4.2 m3 per hour, respectively (FAO, 1977). In the planning and organization of cable systems, planning takes 40 percent of the time; organization takes 25 percent, and the execution of the work 25 percent. The remaining time is 10 percent (Trzesniowski, 1998). This investigation was conducted at two study sites located in Artvin. The first of them, the Alabalik Study Area, is located in the Ardahan Directorate of State Forest Enterprise, Ortaköy Forest District. The other is the Soçidibi Study Area, located in the Artvin Directorate of State Forest Enterprise, National Park of Hatila Valley. Both of them are located in the mountainous eastern Black Sea Region of Turkey. In both study areas, the research was done with the Gantner USW model long-distance skyline (Gantner, 1995). The Gantner skyline was used for the extraction of timber that had been blown down by wind. In the study, the research methodology used for all-time studies conducted during cable logging activities was cumulative, timed exclusively for each work element obtained by extraction. The subjects of observation were the long-distance skyline operations, which were carried out by winch operator. Data were collected to support the analysis of time consumption and the evaluation of time distribution of work phases. The measurement of time consumption and observations obtained were evaluated with the SPSS Statistical Programme. The most effective work phases were determined for total work time and productivity. These studies were completed in August 2000 in the Alabalik area and in September 2000 in the Soçidibi area. The most time consuming work phase times were found to be the hooking and pulling of loaded carriage time in the Alabalik Study Area. Because the skyline was at 35 m in height from the ground, the pulling of the hook to the logs had quite a time consumption. Besides the time involved to unhook the chokers themselves, the hooking took longer because of the delay while workers reached the hook and placed the carriage load pendulum. 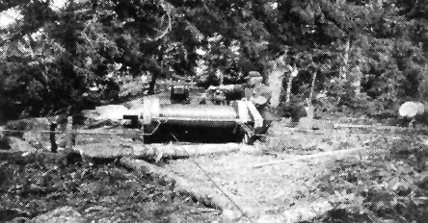 During the phase of pulling the loaded carriage, hooked logs sometimes were hindered by obstacles such as stumps and rocks while ground skidding. In the Soçidibi Study Area, the most consuming work phase times were found to be in moving the loaded carriage and hooking. 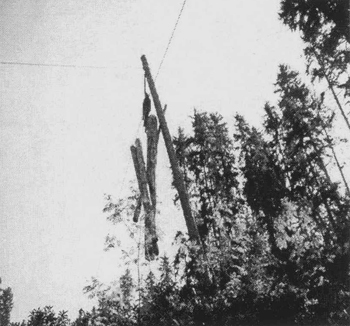 The reasons for this were: delay while the worker reached the empty hook and waited beside the logs; and hindrance of the hooked logs by stumps. As shown in Table 2, in both study sites the work time would have been quite efficient if the workers had not been delayed. Thus, total productive work times were calculated at 92.24 percent of total work time for the Alabalik Area, and 91.61 percent of total work time for the Soçidibi Area. Productivity was normal for the Alabalik Study Area and similar to the literature review. In fact, the altitude of the skyline from the ground was high and the pulling of the hook distance to the logs was long, therefore, the productivity value was a good result. Although the dragging from the side distance was high (35 to 55 m), the logging distance (1 100 m) was suitable for a Gantner long-distance skyline. The number of pieces logged per shift, per shift extracted timber volume, and hauling distance had effective parameters vis-à-vis productivity values. In Soçidibi, productivity was high. Because the hauling distance and the dragging from the side distance was short, this productivity value is higher than in the literature, but worker delay for the pulling of the hook to the logs reduced it. To provide telecommunications between uphill and downhill stations a radio-control system was used. There were three radio users in the Alabalik area, as the uphill radio users' field of view was restricted. While two of them were standing in the loading and unloading areas, one of them stayed half way up between uphill and downhill. The cable crew consisted of six and seven workers in Soçidibi and Alabalik, respectively. the chokers were mostly spontaneously broken up so that the reattaching of them occasionally became difficult. Although both the Alabalik Study Area and the Soçidibi Study Area have mountainous terrain conditions, the use of the Gantner long-distance skyline for extraction was found productive. In the areas studied, hardwood (coniferous) trees, blown down by the wind, were yarded. Extraction was from uphill to a downhill loading place. A sledge winch, located in the uphill station, was set up in the wrong place by mistake, 100 m distant from the anchor tree. In order to be extracted, the logs had been heaped up to the uphill station before the skyline was mounted. At Alabalik, the extraction was accomplished with a Gantner long-distance skyline, and total work times were determined as per average shift (trip period), 27.41 min per shift; per average cubic metre, 14.88 min per m3; and per number of pieces of timber, 9.65 min per load. At Soçidibi, distribution of total time was: 13.43 min per shift, 8.60 min per m3, and 3.73 min per load. Of special interest was the time it took to hook and pull the loaded carriage to the landing place. In addition to the unwillingness of workers, the altitude of the skyline and dragging from side distance, and the hooking of chokers effected the total productive time. Productive work times for each shift were calculated as 92.24 percent (each period time) at the first site and 91.61 percent at the second site. Productivity at Alabalik and Soçidibi, respectively: 4.03 m3 per hour, 6.98 m3 per hour; and 1.84 m3 per shift, 1.56 m3 per shift, were estimated. These results were effected as follows: per shift consumed total work time, timber volume, per set-up and per metre of the cable line, average size of piece number, bridling and angle of the lateral pull to the skyline, altitude of skyline from ground, rough terrain and weather conditions. The use of a Gantner long-distance skyline for both study sites was found productively and environmentally sound. To shorten total work time and to prevent harvesting damage, according to the research, application of the skyline is ideal. If a forest road had been constructed for the extraction of the logs, it would not have been economical and would have been damaging to the forest ecosystem. Planning and organizing work when operating cable cranes is very important and it is the deciding factor for its success. Therefore, where skylines are to be used and mounted, a tactical and operational decision-making process by means of GIS, topographic map and so on should be determined. Environmental aspects also should be considered, as well as the goal that “the higher the total volume of timber to be extracted per crane set-up, the lower the cost per cubic metre of timber transported to the landing”. Skyline altitude must be less than 35 m.
Dragging from side distance should be shortened by means of preliminary skidding. To increase total productive work time, maintenance and repair of carriage, chokers, and cables must be done at the beginning of the work. Winches, pulleys, capstans, cables, fixing devices, support and anchors and mounting equipment and telecommunication devices should be designed ergonomically for operators and workers. To increase worker productivity, dissatisfactions of employees should be corrected; and camps, food and safe working conditions should be provided. Preferably experienced, trained workers should be employed and there should be enough of them. To shorten hooking time, in addition to normal chokers, automatic releasing chokers made by FERIC in Canada (Lisland, 1998) can be used. Acar, H.H. 1995. Evaluation of extraction works with short distance mobile skyline in mountainous region, Tübitak, Journal of DOĞA, No 21, 195–200, Ankara, Turkey. Aykut, T., Acar, H.H. & Şentürk, N. 1997. An investigation on comparison of skylines Koller K300, URUS M III, Gantner in Artvin Region. İ.Ü. Journal of Forestry Faculty, Series A, Vol. 47, No 2.İstanbul, Turkey. Acar, H.H. & Erdaş, O. 1992. Comparison on the transport from compartment of forest products by long-distance winch skylines and the forest road alternatives in Artvin Region, TÜBİTAK, Journal of DOĞA, No 16, 549–558, Ankara, Turkey. Erdaş, O. & Acar, H.H. 1995. Using of Koller K300 short distance skylines during extraction in mountainous eastern Black Sea Region. In I. National Black Sea forestry congress proceedings, (4) 230– 238. Trabzon, Turkey. FAO. 1977. Planning forest roads and harvesting systems, FAO Forestry Papers - 2, Rome. FAO. 1996. Model code of forest harvesting practice, by D.P. Dykstra and R. Heinrich. FAO, Rome. FAO. 1998a. Recent development on environmentally friendly forest road construction and wood transport in mountainous forests, by R. Heinrich. In Proceedings of the Seminar on Environmentally Sound Forest Roads and Wood Transport, Sinai, Romania, 17–22 June 1996. FAO, Rome. FAO. 1998b. Interaction between network of services: forestry and wood harvesting systems, by S. Baldini and C. Pollini. In Proceedings of the Seminar on Environmentally Sound Forest Roads and Wood Transport, Sinaia, Romania, 17–22 June 1996. FAO, Rome. FAO. 1998c. Use of cable systems on soft ground by T. Lisland. In Proceedings of the Seminar on Environmentally sound Forest Roads and Wood Transport, Sinaia, Romania, 17–22 June 1996. FAO, Rome. FAO. 1998d. Wood transport in steep terrain, by A. Trzesniowski. In Proceedings of the Seminar on Environmentally Sound Forest Roads and Wood Transport, Sinai, Romania, 17–22 June 1997. FAO. Rome. FAO. 1998e. Environmentally sound forest infrastructure development and harvesting in Bhutan, by N. Winkler. Forest Case Study: 12. FAO, Rome. Gantner. 1995. Gantner Prospectus. Austria. Gürtan, N. 1975. 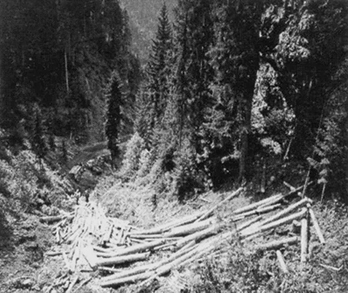 An investigation on rationalization of extraction and felling in steep terrain, project of T.O.A.G., No 81, Series 38. Ankara, Turkey. Ministry of Forestry. 2000. Facts and Figures Forestry In Turkey-2000. Research, Planning and Coordination Board, ISSN 1302–7573. Ankara, Turkey. Öztürk, T. 1996. Capability possibilities of winch skylines In Artvin, (MsD Thesis), İ.U.Forestry Faculty. İstanbul, Turkey.